While the fall is a busy time for everyone, if you are currently working on your law school applications for Fall 2018, you should be wrapping things up! If you are applying for law school this year to enter into school in Fall 2018, consider attending our “Applying to Law School” Workshop to get any of your last minute questions answered. The event is on Monday October 16 at 4PM in the Illini Union Bookstore Building Room 514. Click here for more information. If you are still working on your personal statement, attend our “Perfecting Your Personal Statement and Resume for Law School” workshop on Monday October 23 at 4PM in the Illini Union Bookstore Building Room 514. Please register for this event by clicking here so we can ensure we have enough materials and spots for everyone that would like to attend. Once the Law School Fair is over on Wednesday, you should begin wrapping up your law school applications and registering for open houses and touring schools. Listed below are the open houses or tour opportunities for schools in Illinois. University of Illinois: Contact us today to schedule a visit, attend a class, and meet with faculty, students, and senior administrators to discover all that Illinois Law has to offer. If you are on campus, now is a great time to visit! Loyola-Chicago: Contact Loyola Chicago here to schedule a visit. Southern Illinois University: Click here to schedule a visit. There are opportunities to sit in on classes throughout the fall. Dress professionally for the event. Likely the open houses will have a business casual dress code. Tours may be more casual attire, but check with the school and see what they encourage prospective students to wear. You want to make a good first impression! Read the website and be familiar with the time, date, where to park, and what to bring to the event. Write down any questions you have so you can ask them on the tour or during the visit. It’s Law School Application Week! Check out our 3 wonderful events going on this week! 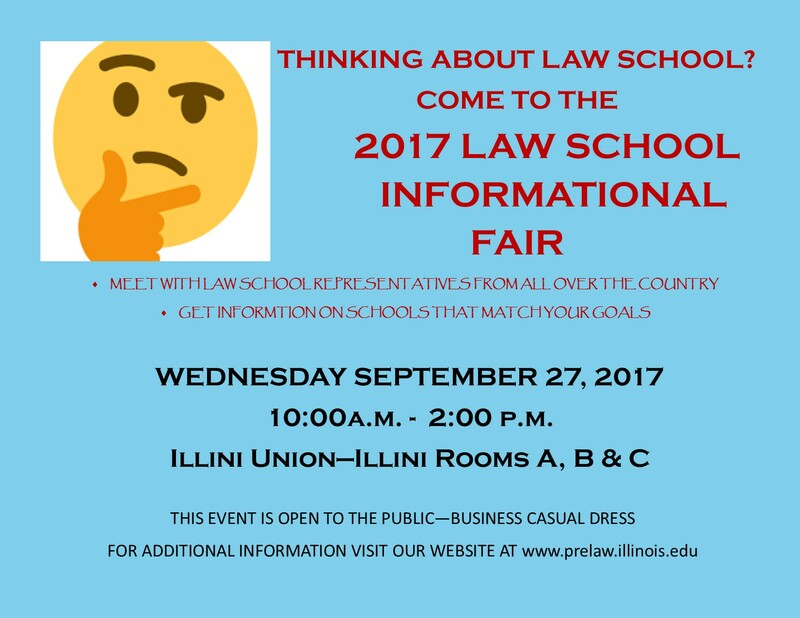 The Law School Fair is Wednesday September 27, at the Illini Union in Rooms A, B, and C. We are looking forward to seeing many of you there! For Law School Application Week we have some great events planned! What are law school admissions professionals really looking for in an applicant? How do they weigh LSAT scores, grades, or work experience? What makes them take notice of an applicant–and what would make them deny someone? Join us for this expert law school admissions panel to discover this and more. Participants will have the opportunity to ask questions. This is a must-see event for anyone considering applying to law school! It’s the biggest pre-law event of the year! Join us as 120+ law schools visit campus to meet all who are interested in applying to law school. Learn about law schools, scholarships, and the application process while meeting the people who will be reading your law school applications. Application fee waivers and other freebies will be available. Stop by or stay the whole time! This event is free and open to the public. Business casual dress. Interested in Northwestern Pritzker School of Law? 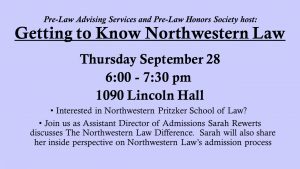 Join us as Assistant Director of Admissions Sarah Rewerts discusses The Northwestern Law Difference. Sarah will also share her inside perspective on Northwestern Law’s admission process, including: the Early Decision program; the interview process; the recent decision to begin accepting the GRE (for the Fall 2019 entering class), and more! This is a great opportunity to get to know Northwestern Law and to have your questions answered! This workshop is designed for incoming students who are new to pre-law or are interested in learning more about it. We will cover: What it means to be pre-law at Illinois, course selection, majors, and extracurriculars, building a pre-law resume, and what law schools are really looking for. We will outline a four year plan to maximize your undergraduate experiences in order to make a great law school candidate. We’ll also take any questions about law school and legal careers. Click the link above to register so that we can guarantee seating and materials for everyone. Each Pre-Law 101 session is the same. Incoming students should attend a Pre-Law 101 prior to setting up an individual pre-law advising appointment. If you took the September LSAT, now is the time to be planning ahead for the rest of the fall semester. The release date for scores (via email) for the September LSAT is October 12. The regular registration deadline for the December 2nd LSAT is only 6 days after the release date. The regular registration deadline for the December LSAT is Wednesday October 18. The late registration deadline (with possible additional fees) is Wednesday October 25. By registering for the December LSAT then, it is not guaranteed that your preferred testing location will be open. Spots will fill up quickly, especially for the LSAT location in Urbana-Champaign. If you took the September LSAT and are currently waiting for your score, this blog entry will go on to discuss how to decide whether to retake. Next week is Law School Application Week! Save the date for the Law School Fair! Next Wednesday, Sept. 27 from 10 am-2 pm at the Union over 100 law school reps will be here to meet YOU! Click here for more details, including a list of who’s coming. 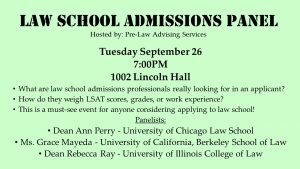 Next week also has the Law School Admission Panel, featuring the admissions deans at UC Berkeley, University of Chicago and at our own UIUC College of Law on Tuesday, September 26. Then on Thursday, September 28, there will be a presentation by Northwestern/Pritzker School of Law. Go to our Events Calendar for information about time and location for these great events. Perfecting Your Personal Statement and Resume for Law School– Tomorrow, Tuesday, Sept.19, 4-5pm. The personal statement is one of the most difficult yet powerful elements of the law school application. Join us for this workshop, which will cover what the personal statement is, how to prepare for writing it, and some tips and suggestions for making it reflect an applicant’s strengths. We will also discuss how the personal statement and resume can complement each other to create a stronger law school application. Each session is the same, so select the one that best suits your schedule. Register here for this session. Engineers and others thinking about patent law! Mark your calendars now for this great event in November! The patent bar exam is the required first step to becoming either a patent agent for the United States Patent & Trademark Office or a patent prosecutor/litigator as a practicing attorney. Students with a background in engineering and the sciences (such as biology, biochemistry, physics, chemistry, computer science) are eligible to sit for this exam. (To see all exam requirements, visit the link below). 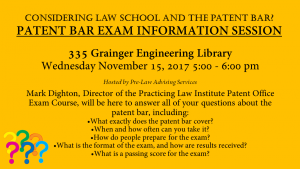 Join us for this Patent Bar session to learn about the exam from an expert. 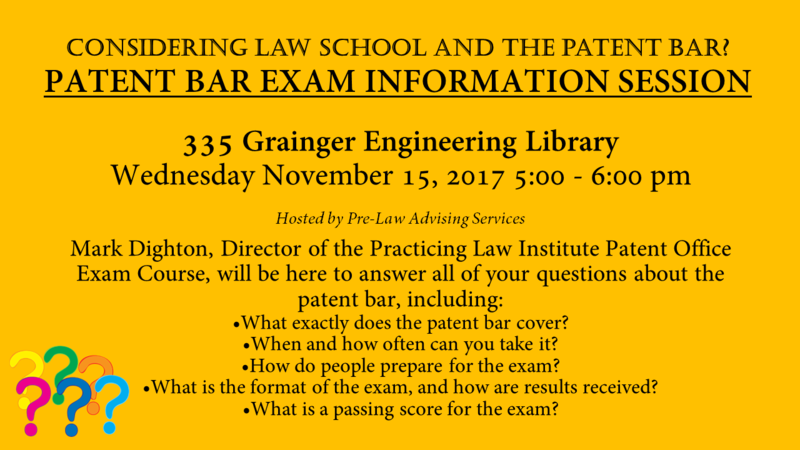 Mark Dighton, Director of the Practicing Law Institute Patent Office Exam Course, will be here to answer all of your questions. For more information and to register for the Patent Bar Exam Info Session, click here. Here are some workshops offered this week. For the full Career Center calendar, click on this link. Justice Jesse G. Reyes, Illinois Appellate Court, First District will discuss important priorities for the legal profession, including diversity inclusion in the legal profession, and providing a voice for a large segment of our middle class and working population.The lecture is free and open to the public. Lunch will be provided to lecture attendees. Minority Association of Future Attorneys (MAFA) meeting is Tuesday September 19 at 7PM. Noyes Lab 165 – everyone is welcome! Prospective Client Volunteers Needed–Please consider volunteering to play the role of a prospective client with a possible legal issue for students in CFI: Interviewing, Counseling & Fact Investigation. Volunteers are needed on September 27 and 28 at varying times. You will meet with and be interviewed by your lawyer for approximately 15-20 minutes. You will be given the fact pattern for the role you volunteer to play. Please consider signing up for multiple sessions. To volunteer or for additional details, contact Angela Martin (aymartin@illinois.edu). Feel free to refer any non-law, or undergraduate friends. Your time is greatly appreciated! Top 6 Ways to Get Law School Application Fee Waivers! Law school applications are now open, which means that application season has officially begun! Those of you who are applying to law school now are finding out how expensive law school applications can be. Each school has an application fee and each school must receive a Law School Report ($35 each), which adds up fast. Attend the Law Fair. If you are not eligible for an LSAC waiver, there are other ways to reduce your costs. First, come to the Law Fair on September 27 from 10:00 a.m. to 2:00 p.m. at the Illini Union. Over 100 law schools will be sending representatives to talk with interested students about their programs and their application process. Many schools at the fair will be giving out fee waivers! (Tip: Make sure you sign in at the law school tables. Many schools will email you a fee waiver afterward.) Click here for more details about the Law Fair, like which law schools are attending. September is a big month for pre-law students–scroll through to see why. 4. Students must attend every meeting unless they emailed the board before the event with reason why they could not attend. Click here to apply by Sept. 15! LAW SCHOOL APPLICATION WEEK is coming! Join us for any or all of these events! 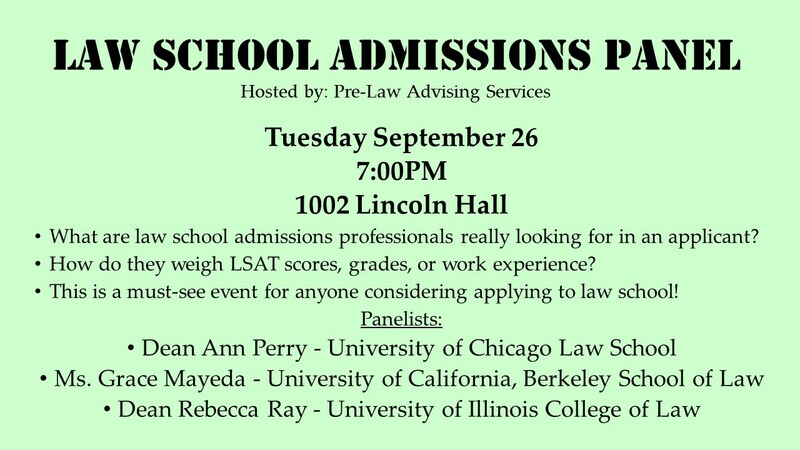 Law School Admissions Panel–Tuesday, Sept. 26, 7:00 pm in 1002 Lincoln Hall. Are you wondering what law school admissions professionals really look for in an applicant? How do they weigh LSAT scores, grades, or work experience? What gets their attention–and what would make them deny someone? Join us for this expert law school admissions panel to discover this and more. Participants will have the opportunity to ask questions. This is a must-see event for anyone considering applying to law school! 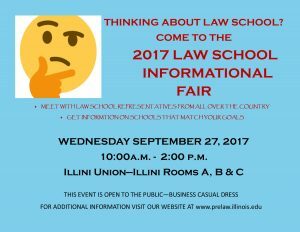 Law School Fair–Wednesday, Sept. 27, 10:00 am-2:00 pm in Illini Union A,B,C Rooms. It’s the biggest pre-law event of the year as 105 law schools visit campus to meet all who are interested in applying to law school. Learn about law schools, scholarships, and the application process while meeting the people who will be reading your law school applications. Application fee waivers and other freebies will be available. Stop by or stay the whole time! This event is free and open to the public. For more information click here to visit our website. No registration required. Get to Know Northwestern Law–Thursday, Sept. 28, 6:00 pm in 1090 Lincoln Hall. Interested in Northwestern Pritzker School of Law? 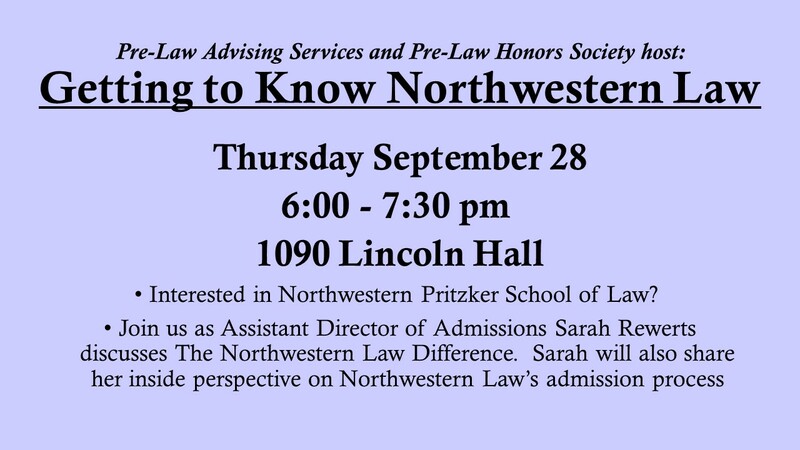 Join us as Assistant Director of Admissions Sarah Rewerts discusses The Northwestern Law Difference. Sarah will also share her inside perspective on Northwestern Law’s admission process, including: the Early Decision program; the interview process; the recent decision to begin accepting the GRE (for the Fall 2019 entering class), and more! 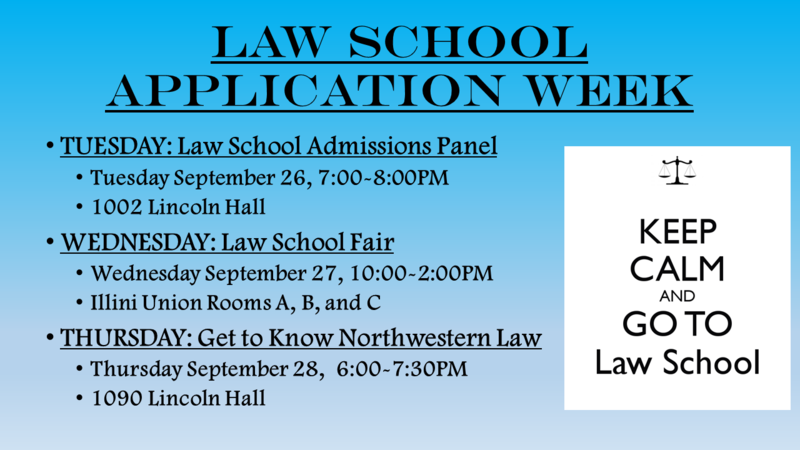 This is a great opportunity to get to know Northwestern Law and to have your questions answered! Constitution Day Panel Discussion: Legal Perspectives on Charlottesville will be held at the College of Law (Max L. Rowe Auditorium) on Sept. 15 from 12:00-1:00 pm. This event is free and open to the public, and lunch will be provided to attendees. Click here for more information. Fall Family Fest–Sept. 17th from 12:00-2:00 pm at Orchard Downs Community Center, 510 Huff Drive, Urbana. Attention student parents! The Women’s Resources Center and Orchard Downs Family and Graduate Housing are housing a family-focused social for student parents and their kids! Join us for games, food, crafts, a music show (sing-a-long), and resource fair for parents! This event is free and open to the public. LER.Masters.Students.InfoSession The School of Labor & Employment Relations will be hosting an Informational Meeting on its Master of Human Resources and Industrial Relations program on Thursday, Sept. 28 from 5:30-7:00 in the Labor and Employment Relations (LER) Building, 405 E. Armory, Room 35. Dinner will be provided, and participants will learn more about a career in human resources along with application requirements to start the program. Click on the link for more details. Applications are due Sept. 12 for the Fall 2017 Career Certificate-International Students program. Click here for more information. Starting Your September Off Strong and Introducing . . . Law School Application Week! Now is the time to plan ahead and make sure you are organized for the fall semester! Attend a Pre-Law 101 session to learn more about what you should be doing the next four years. The next session is: Monday September 11, 4:00-5:00PM, Room 514 of the Illini Union Bookstore. Make sure to get involved on campus with a few extracurricular activities, too! Explore Pre-Law Advising Service’s Compass page for more information. Also consider attending a Pre-Law 101 session if you are new to pre-law. If you are eligible, apply to be a member of the Pre-Law Honors Society. Remember that you will need professors to write recommendations letters for law school applications, so keep in touch with professors! Start planning your potential LSAT date, and consider possible conflicts like work, internships, and study abroad. Solicit letters of recommendation from your professors. Remember to keep your GPA as high as possible. Grades are very important for a law school application. If you haven’t taken the LSAT, pick a date for your test. Our Practice LSAT for Sept. 8 is full, but we will host another in the spring, so be on the lookout for that one. You should be working on your applications if applying for Fall 2018. Attend the Perfecting Your Personal Statement and Resume for Law School on Tuesday September 19 from 4:00-5:00PM in Room 514 of the Illini Union Bookstore. And see our Application Week events below! If you are taking a gap year or two, start considering job opportunities and what you will do during your time off. The Career Center offers more information on Handshake, the new way to apply for jobs and internships. For more information, click here. The Career Center also offers Resume/Cover Letter/ and LinkedIn Reviews, Career Fair Prep, and Resume Workshops throughout the month of September. For more information on the Career Center’s events, click here. Finalize your recommenders for your law school applications. If you have not asked your recommenders for a letter of recommendation, ASK THEM NOW. For more information what you should be doing now to prepare for law school, click here to learn more about Pre-Law Advising Service’s suggested timeline for students. Pre-Law Advising Services offers many great events in September and this year we will have a special week devoted to law school application-related events. 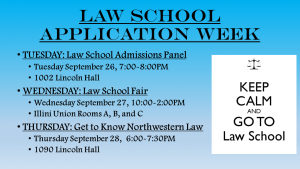 The week of September 25 is Law School Application Week! Here are our 3 great events for Law School Admissions Week! It’s the biggest pre-law event of the year! Join us as 120+ law schools visit campus to meet all who are interested in applying to law school. Learn about law schools, scholarships, and the application process while meeting the people who will be reading your law school applications. Application fee waivers and other freebies will be available. Stop by or stay the whole time! This event is free and open to the public. 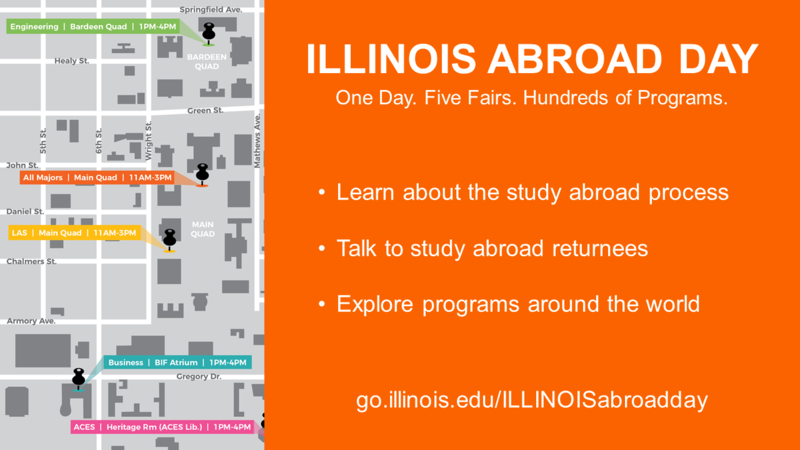 Illinois Abroad Day is Wednesday, September 6th all across campus. Any interested students to stop by one or more of the following fairs to explore programs and talk to study abroad returnees. 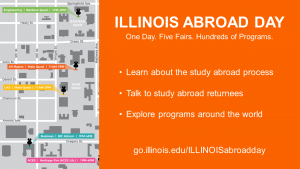 Learn about the Illinois for Illinois (I4I) and Illinois International Programs (IIP) scholarships, nationally competitive awards, and other opportunities to help fund your study abroad trip. This information session will include a short workshop on how to budget for your trip. Contact Sam Celmer at smcelme2@illinois.edu for scholarship questions. For UIUC students interested in learning more about the Psychology major and/or minor. A Psychology advisor will facilitate the 45 minute meeting. For more information, click here. Come see the WRC’s new location and meet the staff! For more information, click here. Native American House, 1206 W Nevada St. Native American House & American Indian Studies invite you to join us for a pot luck dinner to bring in the academic year. This is a welcome community event to meet, connect, socialize, and eat! The main dish is on us. Prepare your family or community recipe or bring your favorite side, dessert, or drinks to share. Sign up by contacting Native American House.